Say hello to the new Missing Calendar. Brand-new design, approved quality, down-the-line. for iPhone/iPod/iPad, requires at least iOS 7.x. The new miCal is the redevelopment of the award winning bestseller for iOS 8. The interface now fits perfectly into iOS 8 and uses a lot of performance-advantages of the new operating system. Quickly create events with the new natural input feature. Natural language input allows you to create events just by describing them. And if you have Siri enabled on your device, you can even dictate your event details instead of typing. Never miss again an important birthday. Get reminders at preset times featuring the music of your choice. miCal communicates with your device’s integrated calendar. miCal works with all the calendar services that your device currently supports (iCloud, Google Calendar, Outlook, Exchange, Facebook Events, subscriptions) without requiring additional configuration. miCal is available in 8 languages. Including English, Spanish, French, Dutch and German. Presenting the event's location on a map and displaying travel time are only two of the small but mighty details. Seamless integration into Notification Center. Show upcoming events or create new events with ease. You can reach the menu from every screen with just one tap. The quick introduction shows you the most important features at a glance. miCal contains 7 different views. The day view lists all events in the corresponding calendar colour. In the month view you're able to list all events of a day by tapping on the the corresponding day. The agenda view is a clear week view of all your events. Holidays and weekends are highlighted. miCal is very flexible when it comes to the views. You can rotate every screen from portrait to landscape mode. The weather view shows a clear weather forecast of your current location. Arrange your tasks into own lists with priorities or use our predefined smart lists. Be notified of due tasks, set priorities and display important tasks in the dashboard. Your tasks will also be synchronized with iOS. We built miCal with every feature that we and other calendar users have been missing, with the goal to provide you with the best user experience possible. Designed in a sleek, flat and simple way, miCal comes with powerful features such as highly customizable reminders, a daily dashboard, integrated weather forecast, eight different views, natural language input and a widget created solely for iOS 8 to give you the best and simplest overview of your events and tasks ever. 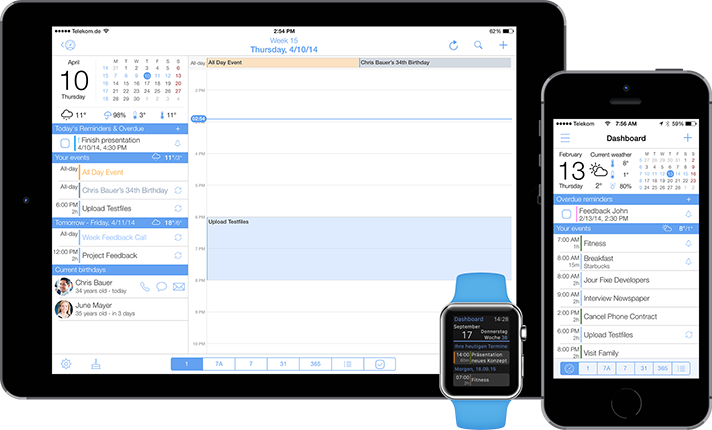 miCal is the missing calendar app that you’ve always wished your iPhone or iPad had! miCal makes scheduling easier, clearer — and better looking — than ever before. miCal presents events, appointments, reminders, birthdays, weather and many more.